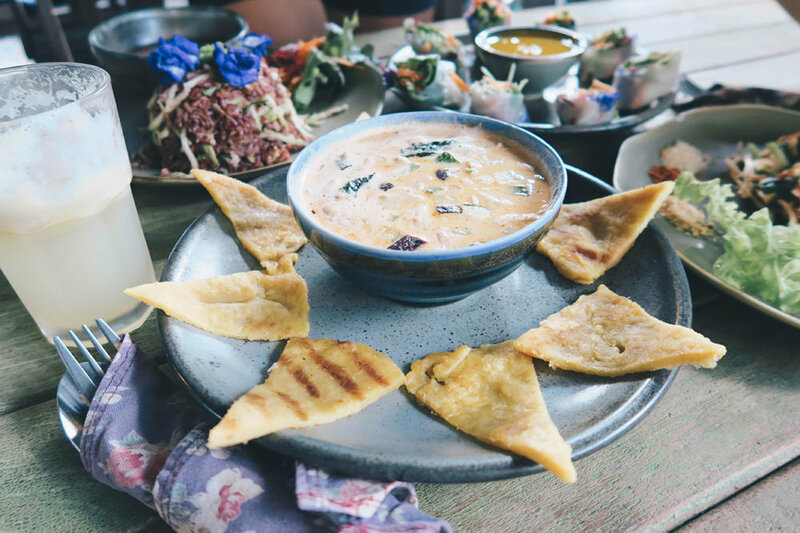 In my first 'Vegan Food Guide in Chiang Mai' here, I shared my Top 5 Vegan/Vegan-friendly cafes. As there are many who requested for me to share more about eating in Chiang Mai, I decided to do a Part 2 of this guide. Continuing on with part 2 of #jasexploreschiangmai! Waking up at 430am was such a struggle, but we did it anyway to catch the sunrise. It was a 1-hour drive to the mountain from our accommodation and another additional 5-10 minutes drive up to the peak of the mountain. Unfortunately, luck was not on our side that day because of the thick fog and mist. Once the skies got brighter, we knew we had missed the sunrise. However, the drive down the mountain made our trip more worthwhile because of the spectacular view. We were so high up that we were amongst the clouds and overlooking the mountains below us. The beauty of nature never fails to mesmerize me. Our amazing view back at Upcountry Bungalows! Breakfast was rice with green curry, made vegan for me upon request. Thai Green Curry is one of my absolute favourites and a must-order when I'm in Thailand. After breakfast, we headed to a tea plantation. They have a variety of tea leaves which you are able to purchase from their store. Check out my Chiang Rai vlog here. Back into the vehicle for a 3-hour drive down to a little village to have lunch and visit a historical museum. It was about a war between China and Thailand many years ago. We were told that in this village, most of their ancestors were from China because they did not leave Thailand after the war. Thankfully It was easy to order my lunch because the villagers understood mandarin. I got rice with stir fry veggie with less oil and salt. Next up was the Golden Triangle. The landscape is hilly, divided by the Ruak River that flows into the Mekong (Mae Khong) River. These rivers form a natural boundary between the three countries Laos (to the east of the Mekong), Myanmar (to the north of the Ruak), and Thailand (to the west of the Mae Khong). By then it was nearing dark fall. It was our last stop of the day before we drove to Chiang Mai. That sums up our trip to Chiang Rai! 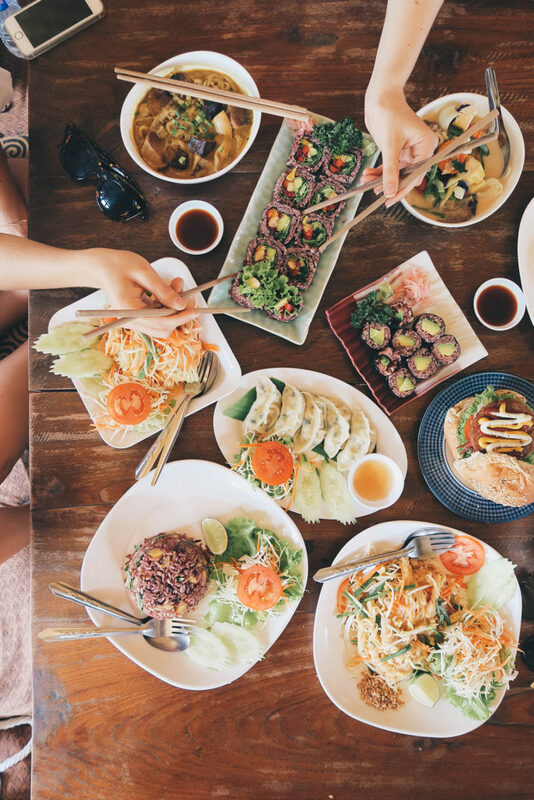 Read my Vegan food guide in Chiang Mai (part 1) here. 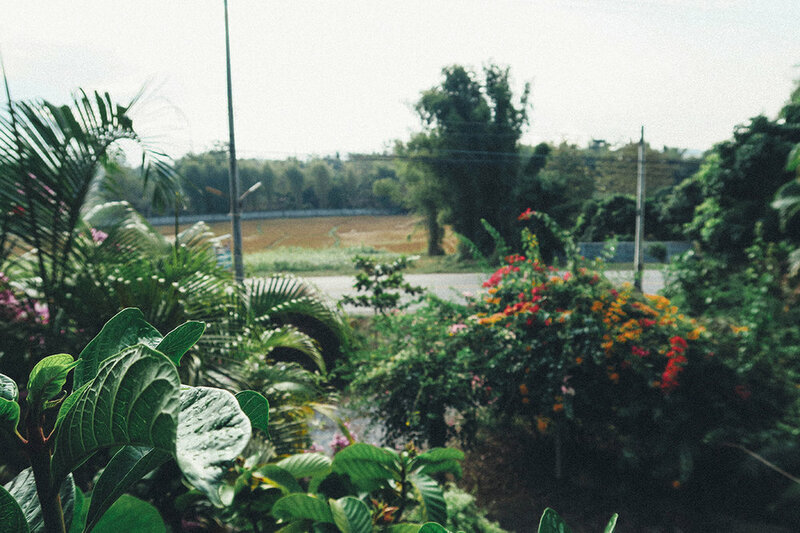 Chiang Rai - A city not known to many, tucked away in a northern corner of Thailand. It is 860 kilometres north of Bangkok, about 200 kilometres northeast of Chiang Mai. Filled with natural beauty, this city is one that's not to be missed. In a nutshell, it's Chiang Mai - but the quieter neighbour with more mountains and a slightly cooler temperature. My mum made a last-minute decision to drop by Chiang Rai, after booking flights to Chiang Mai (pretty confusing, yes) but I'm glad she did. Despite having to drive 3 hours up to Chiang Rai, it was all worth it. 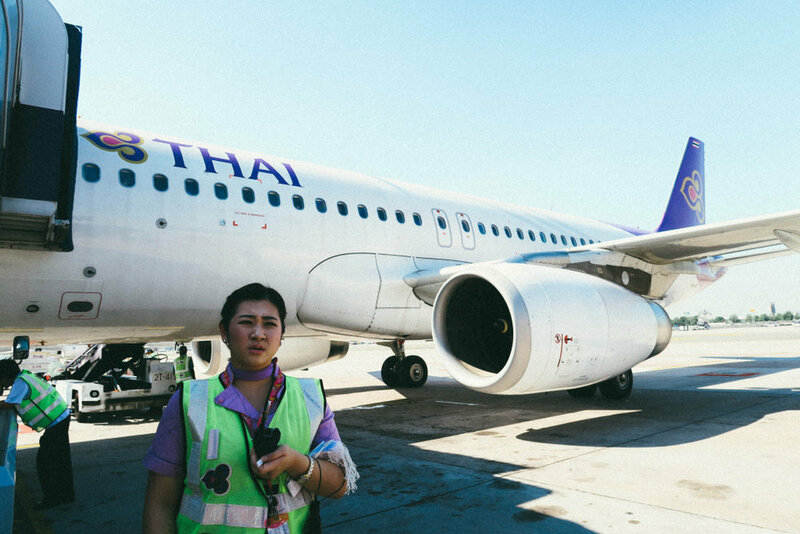 If you did not get to book direct flights to Chiang Mai, transiting at Bangkok can be quite tedious especially on your return flight. We took 2 hours to transit from Chiang Mai to Bangkok, for our flight back home to Singapore. It would be best to get a direct flight if you wish to save the time and worry of missing your next plane home. For this trip, we took Thai Airway and I'm never disappointed with their service. Silkair does direct flights to Chiang Mai (if anyone is wondering)We booked a driver from Trip advisor for the entire trip. Wherever we wanted to go, he'd bring us there. So, of course it is not like Thai Fruit Fest where everyone cycles around. But, definitely can't wait to head back in June to have the whole experience. While driving up to Chiang Rai, we took a pit stop at the hot springs. My mum and I were expecting something bigger. And our faces when we saw the hot springs... speechless. There were tons of shops there selling apparels, food, drinks, souveneirs and little knick knacks, even a 7-11! That way you don't have to worry about being hungry while on the road. I love this coffee stand - definitely something I wouldn't get to see in Singapore. With the lack of communication, I was afraid to patronage at the stall, but my sister had an ice coffee and she said it was good. Super cheap and a big serving as well! From here, we drove to the famous white temple, also known as Wat Rong Khun. 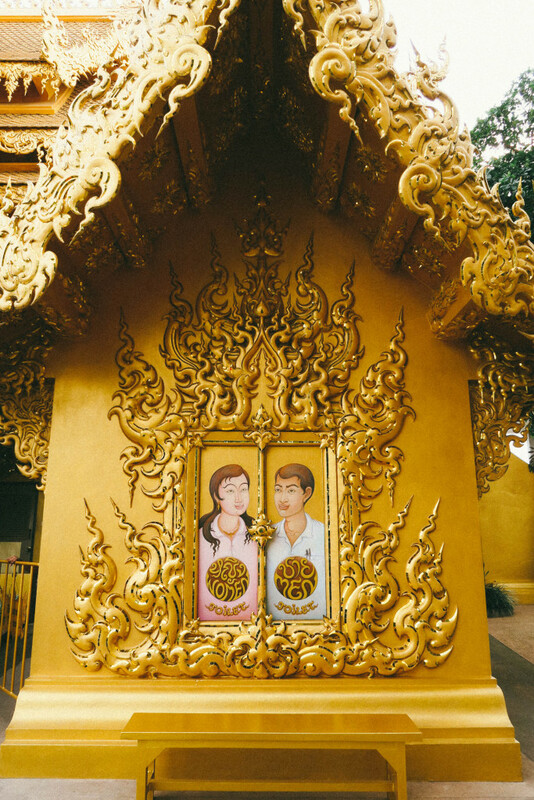 It is a contemporary, unconventional art exhibit in the style of a Buddhist temple in Chiang Rai. It's opened all year round and there is no admission charge for all. I don't think I have ever told anyone this, but I wanted to pursue a Diploma in Interior Design. Of course, that did not happen, but I do appreciate architecture. When I saw this building, I fell in love immediately! It was so structured and detailed that it stood out so well. The reflection of it against the water was so beautiful! You definitely would not miss the toilet when you are there. But, don't mistake it for a temple since it's painted gold. Yes, gold. The entire building, even the toilet cubicles are gold. If you watched my Chiang Rai Day 1 vlog, you would have seen the interior of the toilet - how the walls and doors were all painted gold. It was so crowded with so many tour groups coming in, so my family and I left shortly after. We treated ourselves to mango sticky rice because why not? After all, we were in Thailand and you can't go to Thailand without having mango sticky rice! ;) Not forgetting a cup of mangoes that we bought that were so sweet! We stayed in Upcountry Bungalows, halfway up the mountains so it was pretty chilly up there. Our rooms were connected (I shared one room with my sis, and my parents had the other) and really spacious as well. The toilets were clean and there was an outdoor shower area. If you have seen my Instagram post, you'd have seen the Beagle that lives there. Her fur was so soft and she was so gentle! I couldn't keep my eyes off her. The next morning, she looked for me to play - how cute?! At Upcountry Bungalows, they have a huge garden filled with pretty flowers (you'll see it in my next post), and they also grow their own vegetables so the food we had was really really fresh. After helping us with our luggage, they immediately got us to the dining area and told us they will be serving us dinner. I love how they were so friendly and accommodating to us. The staff there only understood basic English, so I had to use Google Translate to tell them that I am a Vegan, and I also do not wish to have fish sauce, egg or dairy in my food. They seem to understand it well, so I'm hoping there wasn't any miscommunication between the waitress and the chef. They cooked 2 different stir-fry veg for me and I had it with plain white rice (of course) The food was good, but slightly oily and salty. After dinner, we called in a night and headed back to our rooms to rest because we had a reeaally long day. We also set our alarms for 430am the next day because we were going up the mountains to catch the sunrise! Day 1 was basically driving up to Chiang Rai from Chiang Mai and doing really touristy stuff. But it gets more exciting so stay tuned for the other posts coming soon! A week ago Singapore celebrated her 50th birthday, and so my best buddies and I decided to take advantage of the long weekend to spend time with mother nature. Macritchie Treetop Walk for starters, we thought. Instead of thinking how tiring/strenuous it will be, we played music, talked, laughed, snapped and videoed our way through the whole 8km. We first thought our day wouldn't go as planned because it was pouring since 8am and our meeting time was 830am. It was only 'mission accomplished' later in the afternoon when the sun was out again around 12pm. I guess the rain did help the hike a little because it wasn't as humid, but we had muddy shoes after. This wasn't my first time there because I've been to the walk about twice with my family when I was younger. But it was definitely a great experience with my buddies and I'm glad they had fun too. Adding 1 million friendship points for the both of you, for always being so eager to do all these things with me. 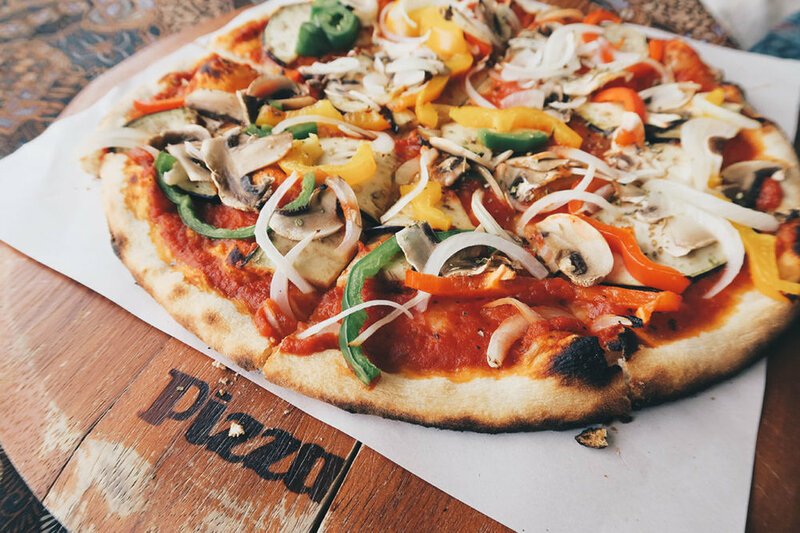 Travelling overseas as a vegan may be rather challenging as many would say. Even tho i did some research on vegan eateries in Bangkok, considering the language barrier and how unfamiliar i was with the street names, it was mission impossible. Thankfully, the locals understand what 'vegetarian' is. Even if you step into a restaurant that does not serve a vegetarian menu, simply tell them that you're vegetarian and the dish you ordered would be plant based. No eggs, no dairy. However, just to be safe, remind them that you do not want any egg in your dish. So far, all the places i dined at managed to get my order correct so i was pretty contented. Chiang Mai however, would be a better city for vegans to visit. Plenty of fruits and vegan cafes available for you everywhere. One reason why i would really love to attend the Thai fruit festival at Chiang Mai next year. P.s: Anyone who's interested to go, please holla at me :) I'm so jealous and envy of everyone who went this year! Everything was ridiculously cheap - even room service was so affordable!! Even dining at food courts would cost max SGD$3 per person. I wish food prices in Singapore were that cheap :( We weren't so adventurous with the street food since I know it would not be to my favour. But i had countless servings of mango sticky rice! It's a must try!! !